Taste test: These are excellent thin potato chips with tons of bacon taste. Some chips try to taste like bacon but end up tasting like bacon grease  not these, they're the real thing. They were a real hit around the chip bowl. Smell test: Very good bacon aroma. 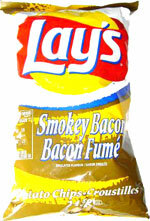 From the package: “Break out the smokehouse flavour of Lay's Smokey Bacon chips — another irresistible flavour from Lay's! Discover why Lay's chips are so deliciously irresistible no matter which flavour you choose! In addition to Smokey Bacon, Lay's chips are also available in our other irresistible flavours like Bar-B-Q, Hot BBQ, Sour Cream & Onion, Salt & Vinegar, Ketchup, and Dill Pickle.” ... One very nice touch on this bag is that Lay's shows both a “fresh until” date and a “made week of” date. 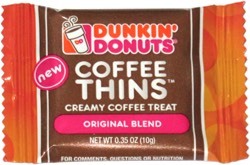 This snack was discovered by Keith and Melissa in Niagara Falls, Canada. Review published .